Arlingtons LISTED DROP IN™ Floor Box Kits are the fastest way to install a BOX nearly flush in an EXISTING floor. Description Arlingtons LISTED DROP IN™ Floor Box Kits are the fastest way to install a BOX nearly flush in an EXISTING floor. 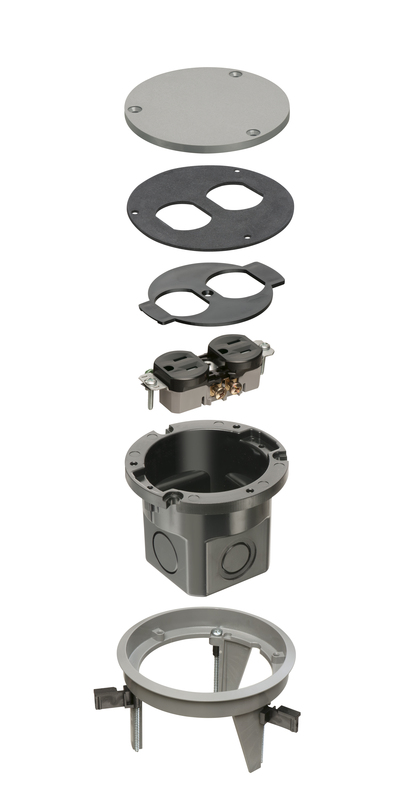 Kit Includes non-metallic cover blank, non-metallic gasket support plate, gasket, carpet ring, UL Listed 15 amp TR duplex receptacle, mounting bracket, NM94 and NM95 cable connectors, (3) #8 x 1/2" flathead screws and (1) #6 x 1/2" screw.